Resistance is vital if we are to spare children from the mind-numbing diet of national superiority and state allegiance that governments around the world are trying to feed them. 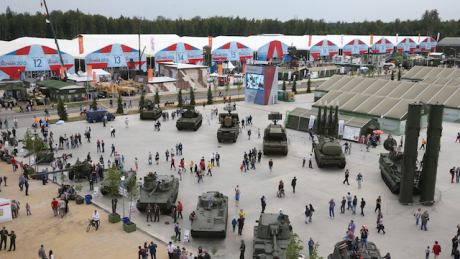 A soft opening for Russia's Patriot Park, 2015. Wikicommons/Government-ru. Some rights reserved.Something strange is happening in Indian universities. A few days ago, the Ministry for Human Resources called for ‘patriotic rock music’ to be performed at the nation’s campuses. In July, the Vice-Chancellor of Jawaharlal Nehru University, one of the country’s largest, asked that a tank be displayed on site to spark ‘patriotic inspiration’ in students. A recently-passed law requires all state-funded universities to fly the national flag ‘to evoke nationalistic sentiments.’ And in March this year, students protesting the ABVP, the country’s powerful right-wing student association, were branded ‘anti-national’ traitors and pelted with stones. Even in relatively free and democratic countries we can find the philosophy of patriotic education in action. In the UK, for example, teachers have been threatened with losing their jobs and even being barred from their profession if they ‘fail to protect British values in their schools’. And in the USA, it is stipulated in the country’s stringent Flag Code that the stars and stripes ‘should be displayed during school days in or near every schoolhouse.’ In October this year, a private college in Missouri launched a mandatory patriotism class for all freshmen. Patriotic education is clearly popular among governments. But why? Consider these few simple observations. Firstly, patriotism is a mercurial and loosely defined sentiment, encapsulating wildly different ideas to different people – just look at the USA, where patriots for and against President Trump are arguing over whether patriotism means loyalty or dissent. This means that national pride can easily be moulded to support various beliefs and ideologies. Secondly, most if not all of the governments championing patriotic education are at pains to equate themselves with the country. As one Chinese citizen put it, ‘loving the country equals loving the Party.’ Lastly, and quite simply: children are impressionable. They tend to believe what their teachers tell them. Put these observations together and it doesn’t seem outlandish to suggest an ulterior motive behind these education campaigns. Could it be, as critics of the Chinese education system have charged, that these governments are engaged in patriotic ‘brainwashing’, employing national pride to inculcate in children obedience and unwavering loyalty to the state and its leaders? If this seems outlandish, consider the effect that such ‘education’ is already having. Research has shown that the longer a Chinese individual stays in state education, the more likely they are to support the Communist Party. In this way Beijing has avoided another Tiananmen-style protest, as a large proportion of the country’s youth, pumped up with national superiority, no longer look to ‘the West’ with envy. In Russia, the classroom obsession with national pride and foreign enemies has helped distract the public from the cocktail of economic and social ills – such as shrinking real wages, rising poverty and high inflation – that are plaguing the country. And in India, the deteriorating and polarising political climate has forged an extremely patriotic body of students that profess unswerving loyalty to Modi and his Bharatiya Janata Party. So let’s call patriotic education by its proper name: propaganda. So let’s call patriotic education by its proper name: propaganda.Patriotic education can be resisted, and has been on several occasions. In 2010, public opposition to an education bill in Slovakia, which would have forced every classroom to display the national flag and coat of arms, forced President Ivan Gasparovic to veto the measures. The creeping patriotism infiltrating Japan’s education system has been met with considerable opposition from the country’s teachers, who, angry at being disciplined or even suspended for refusing to sing the national anthem in school, have launched dozens of lawsuits against education authorities. Perhaps the biggest pushback occurred in Hong Kong in 2012, when attempts by the Chinese government to extend its patriotic education to the city drew tens of thousands of protestors into the streets, eventually forcing Beijing to back down. Resistance such as this is vital if we are to spare children from the mind-numbing diet of national superiority and state allegiance that governments around the world are trying to feed them. No country can consider itself free from this danger: as patriotism is found in every country, so too is the potential for its manipulation and abuse. We ought to ask ourselves: who has the most to gain from a generation of die-hard patriots – the people saluting the flag, or the power that waves it? It’s a lesson we could all do with learning.